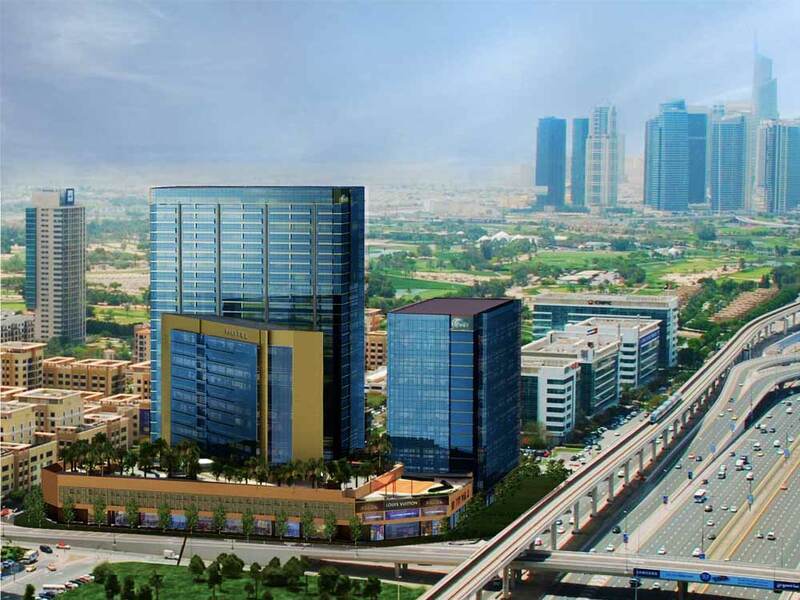 Ishraqah pushes ahead with Dh1.2 billion project. For Dubai-based developer Ishraqah, at times, having projects at one of the best locations in Dubai have both been a blessing and a curse. The developer today is racing ahead to complete construction of The Onyx, a mega mix-used, freehold project. Ishraqah, which is a partnership between Saudi Arabian companies Zahran Group and Bin Mahfouz Group, first announced plans for The Onyx in 2007, to be erected on Sheikh Zayed road opposite Dubai Media City. Work on the Dhs 1.2 billion project commenced soon after announcement, and everything was on track. But the economic recession befell Dubai in 2008 and Ishraqah failed to meet major contractual requirements. But ever since the market recovered, Ishraqah has bounced back on the Onyx, its premier project. Piling work was completed in May 2010 and the bulk of the substructure was ready by 2011. However, there were some more delays to the project’s construction, with work restarting in September 2012. “We faced some difficulties during the 2008 financial crisis. The construction slowed down due to various reason; there were technical issues, then we faced an issue with the consultant on board. But now as the market is gaining confidence, we have restarted our work with a new direction,” said Ammar Sweis, CEO, Ishraqah. Another project that the company boasts of is the Seasons Community, located in Jumeirah Village Circle. “The Seasons Community is already 95 per cent complete and we are just finishing off the last of the few units in order to complete the handover,” said Sweis. Ishraqah for Development Ltd. was established in 2006 as a strategic alliance between two prominent Gulf business groups, Zahran Group and Bin Mahfouz Group, to pursue opportunities in the regional and international property markets. The real estate organization and its sister companies currently manage a portfolio of projects and developments worth over Dhs5 billion covering the UAE and KSA markets. The group has offices in Dubai, Riyadh and Jeddah. The Onyx consists of three towers: Tower 1 bears offices; Tower 2 comprises both offices and residential units; and Tower 3 is a business hotel. The project, with a budget of Dhs 1.2 billion, is under construction and the expected completion date is during the last quarter of 2015. Tower 1 has 13 floors completed and the building core is completed up to 15 floors. Tower 2 has 14 floors completed and the building core is completed up to 16 floors. Tower 3 has five floors completed and 50 per cent of the building’s vertical elements from the fifth to the sixth floors are completed. “Right now the construction of The Onyx is progressing quickly, all thanks to our fast track construction programme. After overcoming the financial difficulties with funding and additional equity from the shareholders, we managed to continue construction work on the project, at a slower pace of course. We pooled in a substantial amount into the project,” Sweis mentioned. Ishraqah has still not directly entered the market for sales of The Onyx. The company has already appointed Al Shafar General Contracting and wants to focus on the construction first. “For Onyx, we have not gone back to the market on the sales side. We are currently focussing on the construction first, to bring back confidence in the project. We are aiming to go back to the market when the construction is in the advanced stages, probably in the next month [August] or the month after, depending on progress of the construction and market conditions,” mentioned Sweis. The Seasons Community is a combination of townhouses, apartments and shops. The project is divided into two clusters: Autumn and Summer Clusters. The project was completed during challenging times and the hand-over process began last year till earlier this year. The total number of apartments in the two clusters are 677 units, total number of townhouses are 83 and total number of shops are 13. “Most of our buyers in the Seasons community are either end-users or investors. We did not have buyers who bought in bulk amounts, such as buildings or floors. Buyers were mostly interested in buying homes to live in or for the purpose of investments from which they can earn rentals in the future,” Sweis stated. The commercial market in Dubai has gathered steam in the aftermath of the financial crash of 2008. And with the Expo 2020 bound to give Dubai’s economy a massive impetus by attracting huge investments, Sweis is of the opinion that demand for office spaces will only increase. “The office market is definitely improving. With the number of visitors increasing in Dubai, the commercial segment is getting stronger. There are quite a few commercial projects coming up, mostly in the Business Bay area, where construction seems to be back on track again,” he believes. The UAE government is currently working hard to enhance and improve the real estate market, in cooperation with both semi-government and private sector companies. According to Sweis, Dubai’s real estate market represents a stable and investment-conducive environment supported by transparent policies and laws. “The past few years have witnessed tangible results following the positive intervention of the government to mitigate any negative aspects. The government has also worked towards regulating the business environment to ensure best practices in the market. For example, the authorities are implementing escrow accounts and installing procedures to prevent speculation in the market. The real estate market in Dubai has become an investors’ hub and an attractive market to those looking for viable business opportunities,” he explained. At present, the demand and supply scenario is strong and Sweis is of the opinion that the market will remain in good shape with the tourism sector amplifying and Expo 2020 coming up. Investors now are more concerned about the right location, good quality and perfect floor plans. “We are dealing with different kinds of investors in the market. People are asking more questions since they want to get every detail right, which according to me is healthy and good for the market. In our case, we have always focussed on having the right mix of quality and floor plans,” Sweis said. Investors have become more careful, and Sweis mentions that the biggest change that he has witnessed is that investors want to see things and not rely on word of mouth. “Definitely investors have become more cautious, they take time to think before they buy. It has also made developers focus on things that people are looking for,” he said. With real estate, it all goes back to supply and demand; as long as there is demand in the market, the sector remains in good shape. Experts say that there is a huge demand in the real estate market presently from all types of investors. “There are some large projects in the pipeline that will be completed in the next few years. The market is in good shape and will remain so because I think there is substantial demand, which needs to be met with equal quantitites of supply,” Sweis elaborates.